I have to admit, I’ve been having fun connecting with different folks during the T.O.F.U. Talks series, and I’m looking forward to meeting more folks as the live chats continue. Next up? Business! 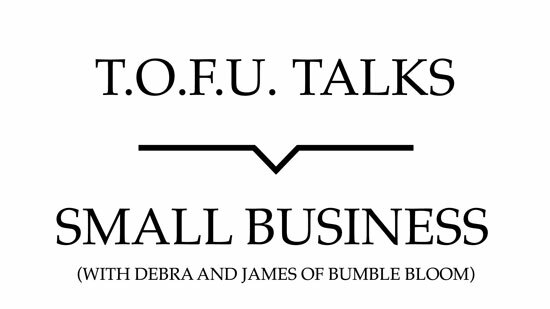 Join me on Saturday, July 14th at 10AM Pacific Daylight Time as I chat with Debra and James of bumble bloom, a company that makes a vegan honey alternative. We’ll be discussing the things necessary to start, run, and expand a vegan business in this day and age, and then we’ll be taking questions from the audience. If you’d like to be a part of that audience, you can find out more about the event here. bumble bloom was created in Vancouver, British Columbia, Canada in October 2017 to offer a more sustainable and ethical alternative to conventional honey. Beekeeping is highly romanticized as the dairy industry was years ago. We feel strongly that this needs to change. We started selling into retail in January 2018, and recently moved to Edmonton, Alberta, Canada in order to scale up production.